Samsung has reduced the number of hardware buttons on the Galaxy S6. There are only four: the Power button, the Volume button, the Camera button, and the Home button. Before you get too far into using your phone, orient yourself to be sure you’re looking at the correct side of the phone. References to the left or right of the phone, assume a vertical orientation (meaning you’re not holding the phone sideways) and that you’re looking at the phone’s screen. The Power button is on right side of the phone, toward the top when you hold it in vertical orientation. In addition to powering up the phone, pressing the Power button puts the device into sleep mode if you press it for a moment while the phone is On. Sleep mode shuts off the screen and suspends most running applications. The phone automatically goes into sleep mode after about 30 seconds of inactivity to save power, but you might want to do this manually when you put away your phone. The Super AMOLED (Active-Matrix Organic Light-Emitting Diode) screen on your Samsung Galaxy S6 is cool, but it also uses a lot of power. Don’t confuse sleep mode with powering off. Because the screen is the biggest user of power on your phone, having the screen go blank saves battery life. The phone is still alert to any incoming calls; when someone calls, the screen automatically lights up. Technically, there are two Volume buttons: one to increase the volume, and the other to lower it. Their locations are shown here. 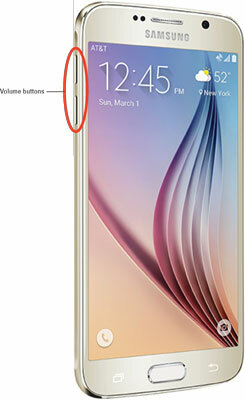 The Galaxy S6 Volume buttons on the left. The volume controls are aware of the context; they can tell which volume you’re changing. For example, if you’re listening to music, adjusting volume raises or lowers the music volume, but leaves the ringer and phone-earpiece volumes unchanged. The Volume buttons are complementary to software settings you can make within the applications. For example, you can open the music-player software and turn up the volume on the appropriate screen. Then you can use the hardware buttons to turn down the volume, and you’ll see the volume setting on the screen go down. From the Home screen, press either Volume button. You can press it either up or down. Doing so brings up the screen shown here. 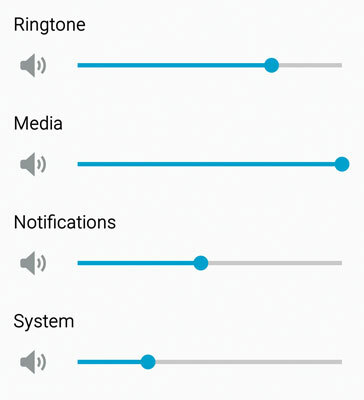 If you press the volume up or down, the ring tone gets louder or softer. Hold off on this tweak for now, and go to the next step. From this screen, tap the Settings icon. The Settings icon looks like a gear. It’s to the right of the slider. Tapping it brings up the screen shown here. The All Volume Settings pop-up. From the screen shown, set the volume at the desired setting. You can adjust the volume of any setting by placing your finger on the dot on the slider image. The dot will get bigger; you can slide it to the left to lower this particular volume setting or to the right to raise it. The biggest button on the phone is the Home button. It’s on the bottom of the front screen. The Galaxy S6 Home button on the front. The Home button brings you back to the home screen from wherever you are in an application. If you’re working on applications and feel like you’re helplessly lost, don’t worry. Press the Home button, close your eyes, tap your heels together three times, and think to yourself, “There’s no place like home,” and you will be brought back to the Home screen. You don’t really need to do all that other stuff after pressing the Home button. Just pressing the Home button does the trick.